I read that Silvio Berlusconi has described the recent negative response of the Italy Constitutional Court on the “legitimate impediment” law an acceptable compromise. "I did not expect anything different," the Italian Prime Minister added this morning. "The trials that concern me are invented; I have sworn on my children that I have not committed any crime." Meanwhile, I read today that Silvio is under investigation by Milan prosecutors for extortion and child prostitution in the Bunga Bunga case. Now, let us be bold. Do you really think that we may get rid of that awful cap thanks to a conviction in one of his many trials? 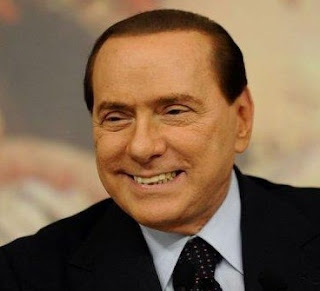 Berlusconi has never seen its assets increase as in the past two years, while newspapers have published the worst about him and his government has made a fool after another. It takes more to completely defeat that guy. When I speak of defeat I do not ask so much, for example to be launched into the empty space with a probe and especially with one way ticket. It is enough to me that he will be no longer head of the government of my country. Besides, I am not here just to criticize, I also propose. I have the honor to announce that me, Alexander Ghebreigziabiher - whose picture you see at the top left - I found a way to defeat Silvio Berlusconi. I stress name and face because I want no one jumps out later stealing my idea. If you ended up here, on this post, you are officially witnesses of my authorship of this genius plan that, once and for all, will free our country from the worst president of the last 150 years, despite what Mr. B thinks about it. I understand that it seems a futuristic idea, at the limit of science fiction, but I think it is achievable. The remedy to defeat Berlusconi and his allies is the following: the opposition. I know it's an abstruse word, unusual nowadays. With considerable effort of imagination, imagine that in Italy there is a party that is totally alternative to the current majority. Think about values, ideals, programs, members and their history, everything entirely alternative to the government of Silvio. For this reason, I am not talking about people blackmail every five minutes for more or less complete lack of credibility. I'm talking about a group of persons with a clear identity, influential women and men, with a strong project, wishing to improve the present and especially the future of our country. Forget the name, emblem and other formalities. What matters is that this group has a fundamental quality: is consistently opposed to Berlusconi and his way to see Italy. This is the reason why I call it the opposition. In the sense that is opposed to his opponent. This is the perfect time, believe me. There are rising unemployment, declining in the support of Prime Minister and in the numbers of the majority, the recent response by the Constitutional Court and I could go on. I understand that at first glance it seems a risk, but trust me. An opposition is the only way to have a government without Berlusconi. The News: Berlusconi, the Constitutional Court’s decision is an "acceptable compromise".